This is glamping at its most luxurious. 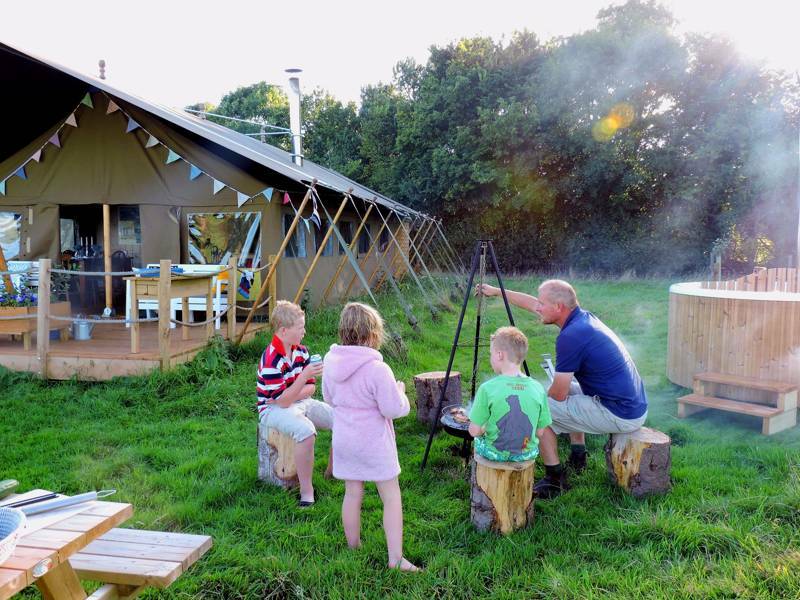 A self-contained safari lodge with a private hot tub in glorious Somerset countryside. Buzzard Safari Lodge comfortably sleeps up to 6 people making it a great place to gather with friends and family. It is in an enclosed field with three other lodges (Hawk and Kestrel). Buzzard is nearest the shop, play area and wood store. The tents are about 20 metres apart giving them an element of privacy but they're still close enough if you want to socialise or book the site as a group. The beds are made up for your arrival with thick duvets and plenty of blankets if you're staying at the start or end of the season. There is a spacious en-suite shower and wash room with flushing loo at the back of the lodge, hot water is provided by a wood fuelled water heater which also warms the bathroom space. The kitchen is well equipped with everything you need to make delicious meals on the wood stove or prepare a barbecue. There's an electric mini fridge/freezer, LED lighting, large wood stove to cook on – a bit like an Aga, an electrical hob plus an electrical socket for charging a phone or laptop. There are also comfy sofas, a basket of board games and dining table for 6 inside the lodge. Outside is a spacious deck with rattan furniture and gorgeous views of the surrounding hills. The deck is fenced and gated. Buzzard, Hawk and Kestrel Lodges are all dog friendly outside of the school holidays. There are private wood fired hot tubs available for each lodge, there is also a barbecue area, hammock and picnic table.